Go on an reserve your getaway now. Also check out all our new Photos. You will love our unit!! Gulf Shores was voted #3 Best Beach and #4 Best Family Destination by Southern Living Readers Jan 2009. Where will you be spending your Vacation? Why not with us? Check out our great prices! Average Temps in July 91 high 70 low. Water 84 Doesn't get much better than this! Welcome to our condo at the Plantation Resort! We have just finished our remodel and you will not be disappointed. This Condo is gorgeous, be one of the first to share it with us. This third floor condo is situated with the breezway on one side no one on top, so one of the more quiet units, and has an awesome view. The resort is great for families with tons to entertain the kids or for couples looking to relax on the fluffy white sands of the Gulf , with two bedrooms, 2 queen beds, queen sleeper sofa, two full baths, and only steps away from the Beach, Heated Indoor pool, sauna, steam room and Jacuzzi. You can park directly in front of this condo and you have a yard area close to the Bar-B-Q. This condo is non-smoking inside but we don't mind if you smoke on the balcony. No pets are allowed at the resort. Beautifully decorated, it sleeps 6 comfortably; has a large fully-equipped kitchen with microwave & dishwasher;New Flat Panel TV and DVD in living room with Cable; wireless internet available at No Charge. Laundry room located at the end of our hall on the same floor. 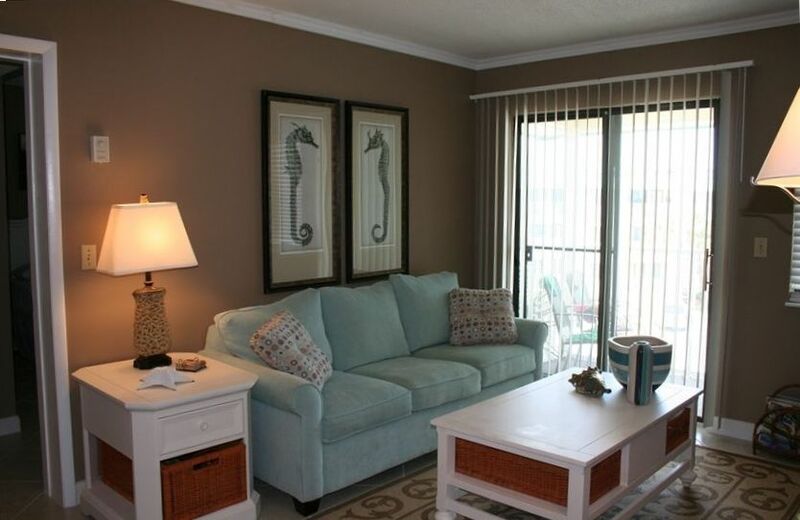 The condo is a Gulf-view, and only a short walk to two outdoor pools and a huge private beach. More pools on sight including 1 indoor. You and the kids can enjoy such amenities as a lit tennis & basketball courts, shuffleboard, horseshoes and an arcade. Next door, the renowned Kiva Dunes golf course offers the finest greens in Southern Ala as well as elegant dining. Also, a Marina with new Tacky Jack's Restaurant just a few miles away! The condo is located at the Plantation Resort, with 24-hour security, away from traffic and hustle of crowds and work, yet only 13 miles from highway 59 where you'll find tons of restaurants, an incredible outlet mall, amusement parks, The Little Zoo That Could. * from I-65 take Exit 37 (gulf shores parkway)or I-10 exit onto highway 59 south (gulf shores parkway). Follow highway 59 south through Foley and over the Dr. Holmes bridge into Gulf Shores. At the fourth traffic light, turn right onto highway 180 west (Fort Morgan road). Travel 13 miles, and you will find the entrance to gulf shores plantation on your left. * from highway 182 (the beach highway in Gulf Shores) turn north on highway 59. Go to the intersection of highway 59 and highway 180 (Fort Morgan road) and turn left. Travel 13 miles and you will find the entrance to Gulf Shores Plantation on your left. * or, take the Dauphin Island ferry across mobile bay and follow highway 180 east for eight miles to the entrance of the resort.Make sure to check ferry times before you travel. Can't wait for you to come Visit with Us! This is my moms unit and she stays very busy with her job. So I as a stay at home mom of two wonderful girls handle all of her inquires for her. My Family and I love the Plantation. We moved to Texas from SC about 3 years ago and my Mother bought this unit as a 1/2 way point for her to see her Grandchildren. We have spent as many weeks as possible over the past few summers and love looking back at our annual beach photos to see how much they have grown. We love the quieter family atmosphere of the Plantation. We never miss our annual dolphin cruise, white sand beaches and excellent seafood. It truly is a vacation destination that once you come to once you will just want to keep coming back.We hope you will come enjoy. This condo was very clean and completely stocked with any cooking ware you might need. Just steps from the ocean which is exactly what we were looking for. The Beach is more private and did not have a very touristy busy feel, which was also great! We really enjoyed our stay and look forward to coming back! We had a wonderful time at Plantation gulf shores. The unit had a nice view and was very clean and well equipped with just about everything you would need. The owner gave a lot of helpful info about what was at the unit already and to stop at the Walmart on the way to the unit since another large grocery store wouldn't be on the way and we would of had to back track 20min ...which would have not been fun after a 17hr drive. I think the inside of the unit was very nice and clean. The outside of the overall building is pretty run down. The hallways to the unit, the grounds, the elevator ect are just a little worse for the wear, but it doesn't effect the stay for the most part. I also wish there would have been a couple beach chairs in the closet with the other beach stuff. It was a bummer to find out that the chairs on the beach you see in pictures have to be rented for a pretty hefty price. So we ended up just sitting on towels each day and it was kinda a bummer. Had I know,I would have brought the 4 I have at home. The location is great for getting out of the craziness, but it is kinda far from any family activities and the main road to get to everything is so busy, just kinda made getting around a chore. Overall the trip was great. 5he beach was beautiful, the unit was clean, pools were cold but clean, and we all had a good time. Cozy place and convenient location! We loved our stay at this condo! It was the perfect size for two couples. We spent most of our time at the beach, so the short walk was a great asset to this property. The kitchen is stocked with all the essentials. We had everything we needed and more! We will be back, thank you for letting us enjoy your slice of paradise. I rented this place for my snowbird dad he was very happy with it he will be returning next year. Mrs Kennedy the owner made the rental process easy. The condo was out of the way and quiet. Yet close to everything. Everyone was friendly. LOVED listening to the waves. We would definitely stay here again.